Apparently October is national stamp collecting month. (I'm fully aware that "national" in this case does not refer to a country I am from or currently living in. That's besides the point) I actually have a couple of ideas relating to that, the first one is to show you some cool stamps. No! Wait! They are actually pretty cool... Not in the nerdy way I get excited about things, but... Ok, maybe a little in that way. I did recently find some super fun ones... Roadside attractions! Seriously! How awesome are these? 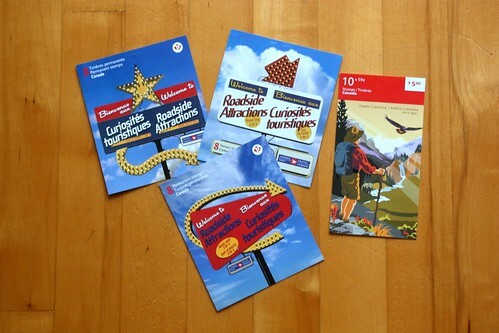 I now have three booklets of roadside attractions, each has 8 stamps, 2 of each design. There's also a booklet about national parks (the stamps have the same picture as the cover of the booklet, how cool is that?). I had to get that as well, since they had such an awesome retro vibe! I've already sent a bunch and can't wait to use more of them! 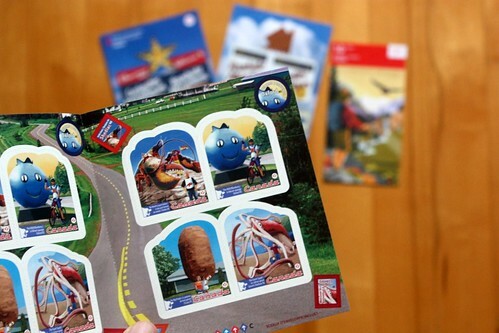 Do you pick and choose which stamps to use in your mail? If so, where do you get your stamps? I see, interesting. I've only become aware of the stamps I use relatively recently. At first I would just go to the post office periodically, hoping to find something, but I try to keep up to date with it now. I just think it's great that you at least can get the stamps later, even if it takes a while. I never would've gotten these giant squid ones (can you tell which one is my favourite) otherwise. Oh wow, you are lucky indeed! That sounds like an amazing place to go for stamps. I'm glad I can order some, but seeing them all at one place and then choosing sounds like so much fun. It's so important too that a place like that has someone there who knows what they are talking and seems into it as well. Finding a person like that at any place of business is so great!